TOPIC: adding "numbers of persons" in search module? My intention is that it works ok I will buy the pro version, is possible? Last Edit: 2012/06/07 14:16 By . In real estate manager, if you have last version - in free and in pro version - you may create any property field - simply rename any fields what not useful for you with help language file. That will work and for Real estate manager - Property search module. Search field - you may hide, but as result how search will work ? would work with other search fields, is possible? 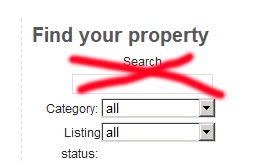 Because now we do search through all properties - Keyword - what you typed in search. If search remove - we will not know what need search.